The Union Home Minister, Shri Rajnath Singh addressing at the Closing Ceremony of the 2-day National Conference on Drug Law Enforcement, organised by Narcotics Control Bureau (NCB), MHA, in New Delhi on March 24, 2018. The DG, NCB, Shri Abhay and Director, IB, Shri Rajiv Jain are also seen. 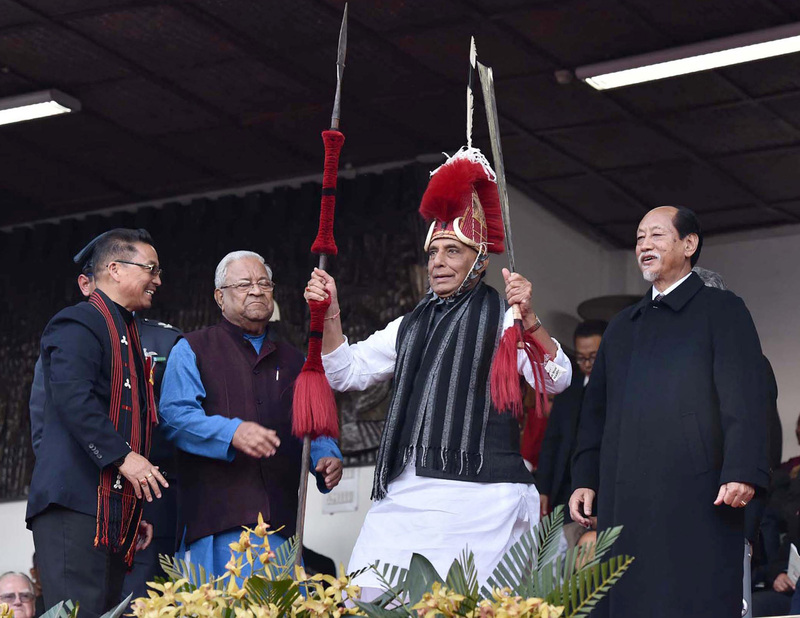 The Union Home Minister Shri Rajnath Singh said that India is vulnerable to narcotic drug trafficking as it is located between two largest Opium producing regions of the world i.e. Golden Crescent in the west and Golden Triangle in the east. He was speaking at the Closing Ceremony of the two-day National Conference on Drug Law Enforcement organized by Narcotics Control Bureau (NCB), Ministry of Home Affairs here today. Shri Rajnath Singh said that drug trafficking and abuse pose serious threat to our societies and is matter of serious concern for all of us. He said that drugs endanger peace, health and stability across regions and it places a heavy burden on public health systems. Hence all of us have to work towards prevention of narcotic drug abuse, Home Minister appealed. He emphasized both on supply reduction and demand reduction of drugs. He said, diversion of precursor chemicals and production and trafficking of New Psychoactive Substances poses another challenge. The Minister also highlighted that the illicit cultivation of Opium and Cannabis in some parts is a matter of concern and must be suppressed. Shri Rajnath Singh pointed out that during 2017, various drug law enforcement agencies effected seizure of 1,991 kg Opium, 2189 kg Heroin, 1,96,792 kg Ganja, 2657 kg Hashish and 67 kg Cocaine. Various agencies also carried out destruction of illicit cultivation of cannabis and opium poppy all over the country, he said. The Minister expressed concern that involvement of foreign nationals in drug peddling poses another significant challenge of drug trafficking in India. He said, during 2017, 332 foreign national have been arrested in drug cases in India. He added that these foreign nationals were found involved in trafficking of Cocaine from South America to India via Africa and trafficking of Heroin and Precursor chemicals to South East Asia and Africa. Highlighting several policy and other initiatives by the Government to deal with drug trafficking problem, the Home Minister said, it constituted Narco-Coordination Centre (NCORD) in November, 2016 and revived the scheme of “Financial Assistance to States for Narcotics Control”. Besides, he said, in 2017, the government approved new Reward Guidelines with increased quantum of reward for interdiction or seizure of different illicit drugs. The Minister pointed out that for effective coordination with foreign countries including neighboring countries, India has signed 37 Bilateral Agreements/Memoranda of Understanding. In last four years, he said, we have signed 05 Bilateral Agreements/MoUs with Australia, Singapore, Mozambique, Thailand and Nepal in drug matters. Taking note of emerging drug abuse pattern, he said the government has scheduled 07 new substances into the list of Narcotic drugs in the year 2017 so that action can be taken against trafficking in these substances. The Minister said, Narcotics Control Bureau has been provided funds for developing a new software i.e. Seizure Information Management System (SIMS) which will create a complete online database of drug offences and offenders. Shri Rajnath Singh said, the government has constituted a fund called “National Fund for Control of Drug Abuse” to meet the expenditure incurred in connection with combating illicit traffic in Narcotic Drug, Psychotropic Substances; identifying, treating and rehabilitating addicts, and educating public against drug abuse, etc. Further, he added, the government is conducting National Drug Abuse Survey to measure extent, pattern and trends of drug abuse in India through Ministry of Social Justice & Empowerment with the help of National Drug Dependence Treatment Centre of AIIMS. He said, there is urgent need to encourage use of technology in drug interdiction. To stop the inflow of money generated from illegal trade of narcotic drugs into our economy, proper financial investigation needs to be conducted in each significant NDPS case, the Minister said. The Home Minister also called for identifying drug syndicates & cartels and their kingpins and take stern action against them to disrupt their illegal business. He said, we need to spread more awareness among the public particularly among youth about ill effects of drug abuse and need to create adequate infrastructure for treatment, rehabilitation and harm reduction for the victim of the drug abuse. The conference was inaugurated by MoS (Home) Shri Hansraj Gangaram Ahir here yesterday. More than 50 State and Central law enforcement agencies involved in combating drug trafficking participated in the Conference. They included State Police organizations, State Excise departments, Border Guarding Forces, Central Armed Police Forces (CAPF), Directorate of Revenue Intelligence (DRI), Central Bureau of Narcotics (CBN), CBI and other Central agencies involved in drug enforcement work. More than 110 delegates attended the Conference. The Conference working sessions focused on various topics such as ‘Wider context of drug trafficking in India’, ‘Financial Investigations’ and ‘Foreign & Cyber Investigations’. During these sessions various agencies gave presentations while UN and other foreign law enforcement agencies shared their experiences.